Top designer Alison Tordoff has reached the finals of a major business award scheme. Alison, who runs Windermere-based Fidget Design, is in the line-up for the Enterprise Vision Awards which recognise women in business from across the North West. Recognised as dynamic and inspiring interior architect, Alison set up Fidget Design in 1997, and has earned a reputation as one of the most creative and innovative designers in the UK. 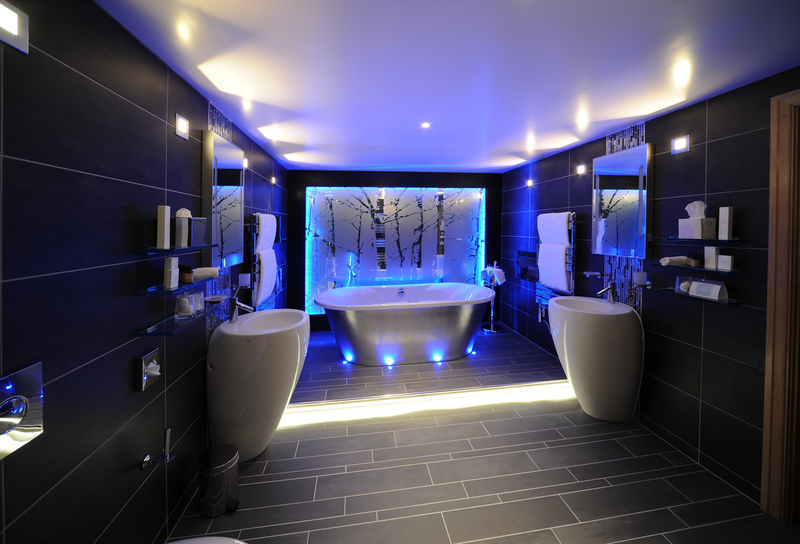 She has worked on a wide variety of prestigious projects with top brands including Jaguar, Aston Martin, The Samling, Langdale Leisure Club and award winning Serenity Spa at Seaham. Her designs for the Cedar Manor Hotel won Best International Hotel interior at the Bloomberg Hotel Awards. She has since created a distinctive Welcome Lounge at the hotel which helped them win a string of regional, national and international awards. She pioneered a new range, The Love District, home furnishings based on the landscape, history and traditions of the Lake District, including cushions embroidered with the outlines of the fells, and a Lakeland bookends wallpaper. Alison has recently been working with universities and design organisations and publishes a regular and highly regarded blog about design issues. And she is involved in a major Cumbria-based interactive project involving artificial intelligence, robotics and human machine learning. This entry was posted in Uncategorized and tagged cedar manor hotel, Fidget Design, Windermere on July 9, 2018 by Stagey Lady. Windermere’s Alison Tordoff who runs Fidget Design has reached the finals of the Enterprise Vision Awards, the North West’s premier women’s business awards. Alison was nominated in the Creative Category, and will now be interviewed by a panel of judges prior to the winners being announced at a red carpet dinner in Blackpool in September. She was chosen as a finalist from hundreds of entries across the region. Alison’s company is well known locally, nationally and internationally and she has won awards for her designs including Windermere’s Cedar Manor Hotel, the best small hotel in Cumbria 2014 and recently highly commended in the Visit England excellence awards. 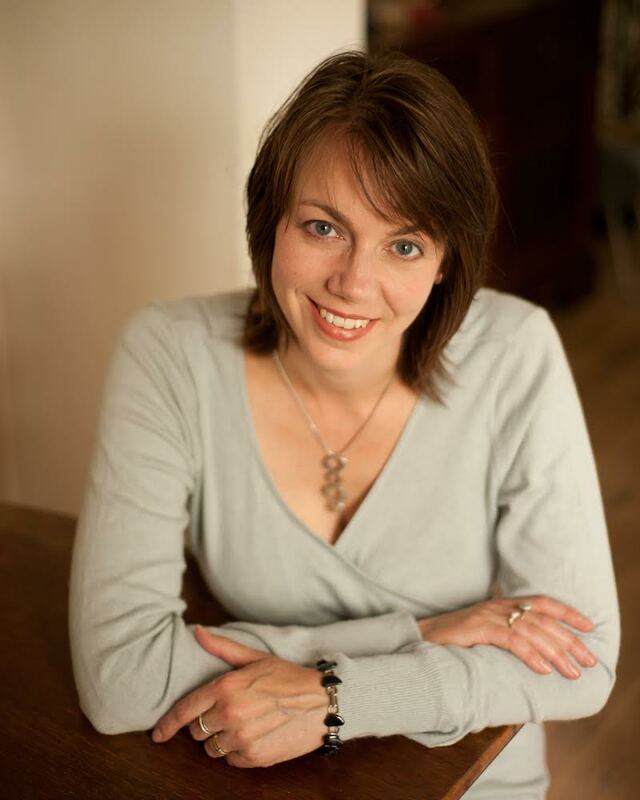 She writes a monthly column for Lancashire Life magazine, and she was Cumbria Businesswoman of the Year in 2003. Alison recently launched a new range of home décor products under the Love District label, all of them paying tribute to the history, landscape and heritage of the Lake District. 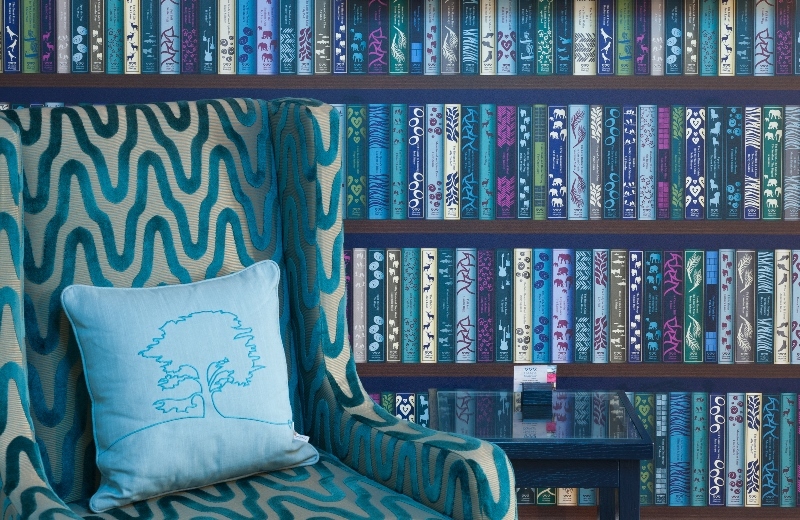 It includes a distinctive “Lakeland books” wallpaper which is a feature of the new welcome lounge at the Cedar Manor. Married with two children, Alison says that juggling deadlines, contractors and family is “just part of life”. The EVA awards, now in their fifth year, aim to help women celebrate their achievements and contemplate future business development. Finalists are linked to the EVA website and winners are featured prominently, allowing extensive promotional opportunities. This entry was posted in Uncategorized and tagged Alison Tordoff, Fidget Design, Love District, Windermere on July 10, 2015 by Stagey Lady. This entry was posted in Uncategorized and tagged Alison Tordoff, Eldergrove, Fidget Design, The Love District on April 3, 2015 by Stagey Lady. 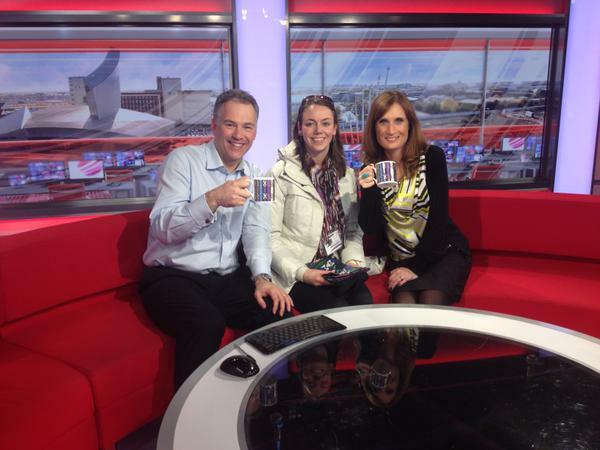 North West Tonight presenters Annabel Tiffin and Roger Johnson were presented with rather special mugs on World Book Day. The china mugs, created by award-winning designer Alison Tordoff for her new Love District range, featured two favourite books chosen by the news anchor team. Annabel had picked a family favourite from when her children were younger, If you give a pig a pancake, while Roger had chosen The case of the missing masterpiece. Both titles were incorporated into a wraparound design of bookends featuring Alison’s fantasy news and weather related books. 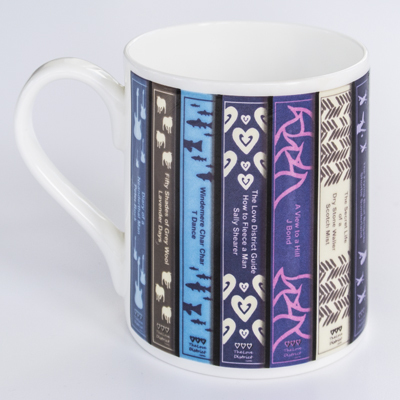 A range of china mugs featuring Lake District spoof titles was also launched on World Book Day. The same titles can be found on a wallpaper design in the Love District range, and on tea towels and aprons. The wallpaper was made originally as a prototype for Windermere’s Cedar Manor Hotel, which has won awards for design excellence. The Love District is a new label from Fidget Design which celebrates the history, culture and landscape of the Cumbrian fells and lakes. 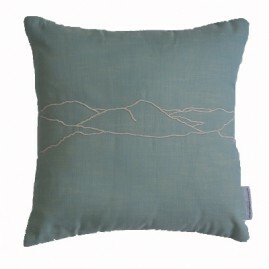 The range also includes hand-made cushions decorated with outlines of the Lakeland fells, including Catbells, Haystacks, and the mountains at the head of Wastwater, voted Britain’s favourite landscape view. “The ideas for this new label were inspired by Cumbria and the Lakes,” said Alison, who has won awards for her hotel designs. Based in Windermere, Fidget Design has won national and international awards including best hotel interior in the International Hotel Awards. Items from the Love District range can be bought from the website, www.thelovedistrict.com. The range will eventually include design-led gifts and home accessories including fine china mugs. A percentage of the initial sales of the new range will go to the charity Lupus UK, which is researching causes and possible cures of the complex auto-immune disease. This entry was posted in Uncategorized and tagged Alison Tordoff, BBC, Fidget Design, Lake District, Love District on March 8, 2015 by Stagey Lady. 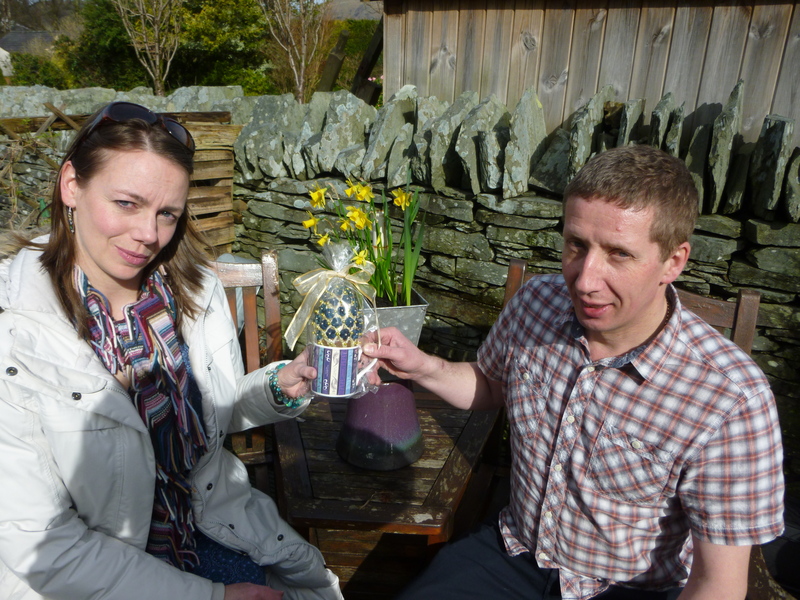 Valentine’s weekend sees the launch of a new designer range for home decor for those who love the Lake District. The Love District is a new label from award-winning Fidget Design in Windermere which celebrates the history, culture and landscape of the Cumbrian fells and lakes. 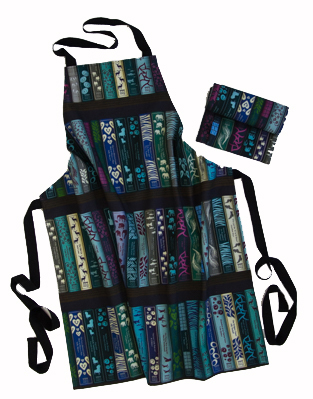 It includes a distinctive “Lakeland bookends” wallpaper, with matching aprons and tea towels, along with cushions and other home décor fabrics. The designs were created by Fidget’s Alison Tordoff who came up with all the quirky and tongue-in-cheek Lakes-related book titles and authors. The wallpaper was made originally as a prototype for Windermere’s Cedar Manor Hotel, which has won awards for design excellence. The book titles depicted include Windermere Char Char, Fifty Shades of Grey Wool, The Secret Life of a Dry Stone Waller, Skinny Dipping for Beginners by Dawn Plunger, and Wordsworth and the Railways by Bill Halt. 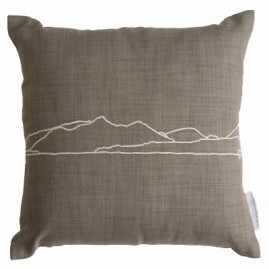 Cushions are decorated with outlines of the Lakeland fells. “The ideas for this new label were inspired by Cumbria and the Lakes,” said Alison, who has won international awards for her hotel designs, and is a former Cumbrian Businesswoman of the Year. Items from the Love District range can be bought from the website, http://www.thelovedistrict.com. The range will eventually include design-led gifts and home accessories including fine china mugs. This entry was posted in Uncategorized and tagged cedar manor hotel, Fidget Design, Lake District, Love District, Windermere on February 12, 2015 by Stagey Lady. Christmas lights in Windermere and Bowness this year will feature the work of local contest-winners in a project organised for the town’s three primary schools. Award winning designer Alison Tordoff, who lives in Windermere, has set up a competition for children to design their own festive lights. The winning designs will be made into illuminated lights and displayed in Ellerthwaite Sqaure hanging in and around the tree. The big lights switch-on in the town is Saturday November 29. Alison, who runs Fidget Design, has enlisted the help of Liam Clark at Kendal’s Sun Signs who will be making up the shapes of the final chosen designs, ready to be attached to LED rope lights. Children from St Martin and St Mary’s, Goodly Dale, and St Cuthbert’s primary schools are all taking part in the competition. It is planned to have two winners from each school, and the children’s artwork will be displayed in local shop windows. They will also be displayed at the Windermere Aquatic clothing store and Fun Factory whose managing director Grahame Armer is sponsoring the competition. This entry was posted in Uncategorized and tagged Bowness, Fidget Design, Windermere, Windermere Aquatic on November 11, 2014 by Stagey Lady.